West London based lighting and sound rental company Entec continues its long and productive 20 year working relationship with British band Blur, supplying lighting and sound equipment for the band’s current tour. 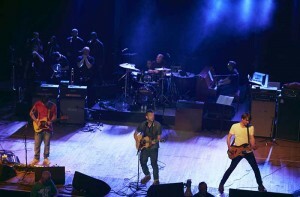 As one of the most influential and creative bands of the last 20 years, Blur has received numerous awards including Grammys, Brits, Ivor Novellos and NMEs, while their live career has spanned clubs, parks, dog-tracks, theatres, museums and arenas and embraced many truly memorable festival performances worldwide – including a historic Sunday night appearance at Glastonbury in 2009. Following their ‘Outstanding Contribution to Music’ Brit Award of 2012, the band debuted two new songs at their sold-out and critically acclaimed show in Hyde Park which helped close the London Olympics, and went on to receive ‘Best Live Act’ at the 2012 Q Awards. This year, Blur embarked on a 30 plus date world tour which has seen the band play to fans around the globe, including dates across Asia, Europe, South America, as well as a headline slot at the Coachella Festival in California, with more dates to be announced. Entec’s Sound department is supplying a monitor and control system for the band’s summer shows, working with Blur’s engineers Matt Butcher (FOH) and Dave Guerin (monitors), while Entec Lighting is providing a festival specials package to lighting designer Dave Byars. A Midas PRO9 FOH console was specified by Butcher and also at FOH Entec supplied a Midas DN9650 network bridge that allows him to do a multi-record on his laptop via MADI interface. Butcher is adding some of his own effects to the package including EL8 distressors and his infamous bespoke self designed and manufactured Ladyboy unit. A Yamaha PM5D-RH console from Entec is used by Guerin to mix monitors which are 20 x d&b M2 wedges, purchased new by Entec for this Blur summer season, all powered by new d&b D12 amps. The side fills are two d&b V-SUBS and two V8 tops per side, together with a further two V-Subs and a pair of M2s for the drum fill. An Entec Veam 64way line system deals with the monitor split to the Midas DL351 stage box feeding the PRO9, and this also feeds into the various festival audio systems when they are playing in that scenario. The band purchased its own mics package at the start of the tour. Entec’s own Ed Hammond and former Entec employee Shabby (Adam Draper) are the current systems techs. Liam Halpin worked on the start of the tour but left for a while to fulfil other commitments in June and July. Dave Byars has been lighting Blur’s live shows for 23 years and is still coming out with new and original ideas and enjoying the whole process of touring and doing gigs. For this run of shows he designed eight truss towers on custom Entec touring bases for quick deployment, and these are stood upstage. From the centre outwards are two at 4ft high, one at 5ft and one at 8 ft, mirrored the other side. On the top of each tower is a Vari*Lite VL3000 moving light. On the side of each is a PixelLine 1044 LED batten and on the front of each is an Atomic strobe and a 2-lite Mole. On the upstage side of all eight towers – hidden from view – is a Robe LEDWash 600, used to highlight the painted Westway backdrop behind. All the floor lighting is controlled via Byars’ own Avolites Sapphire Touch console and he also hooks the overhead ‘house’ rig in to this at each venue. Entec’s Peter “Pepper” Schofield is the Technician. Byars explains that the ethos behind this design is to keep it as visually clean and uncluttered as possible so the Westway backdrop is clearly visible as a primary visual element to the stage and performance. The whole floor rig is also designed to be completely festival-friendly. For those shows which are ‘own headliners’ his overhead lighting spec is based on practicality and having a good chance of actually getting what you’d like in some of the more remote corners of the world!